C.A.W. HVAC Company Inc is proud to serve the Beeville community! About Beeville, TX - Happy to be your hometown Heating & Air Conditioning Contractor! Beeville is a small town in Texas. With a population around 13,000, the area has history dating back to the 1830s. Public education services are provided by the Beeville Independent School District, there is also the Joe Barnhart Bee County Library - Beeville, Texas, and for continuing education there is the Coastal Bend College. Artists and art enthusiasts can enjoy the Beeville Art Museum. The 1912 Bee County Courthouse is a perfect example of historical courthouses as it has a statue of the Goddess of Justice, a clock and a dome. Medio Creek is a Texas Historic Landmark. 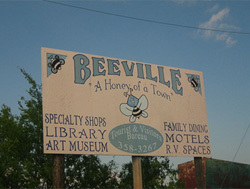 The Beeville climate is hot in the summer and mild in the winter. This allows outdoor activities to be enjoyed by outdoor enthusiasts and children year-round. It's a perfect small-town retreat and getaway from the cold winters of other areas. Summertime is lengthy, allowing plenty of time to enjoy the sun.